Pour cherry pie filling into medium microwavable bowl. Microwave uncovered on High 2 to 3 minutes, stirring after each minute, until warmed through. Top whipped cream with mini chocolate chips for extra indulgence. 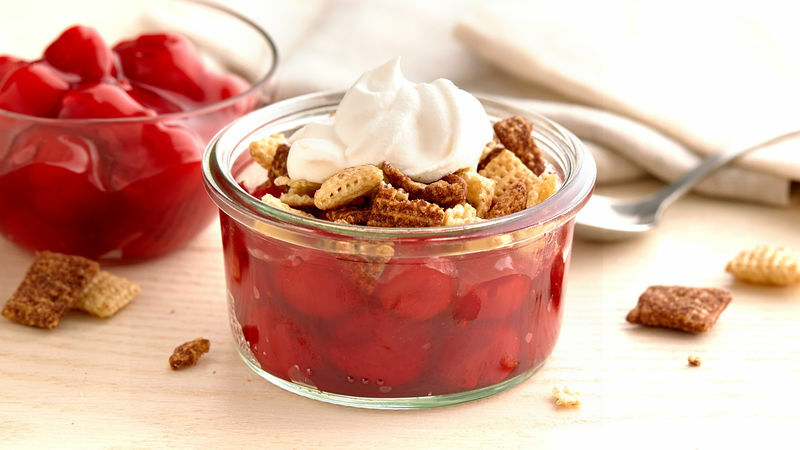 To make a fresh cherry pie filling: In large microwavable bowl, stir 4 cups pitted fresh or frozen (thawed) dark sweet cherries, 2 tablespoons packed brown sugar and 2 tablespoons cornstarch. Microwave uncovered on High 6 minutes, stirring after 3 minutes. Cool slightly. Divide cherry mixture among ramekins. Top each ramekin with 1/4 cup crushed cereal and 2 tablespoons whipped cream.